Go to item 65A in the shopping cart. This is the first and only publication that is a true description of the "nuts and bolts", inside and outside, step-by-step overview of how, and why, a rocket belt works. 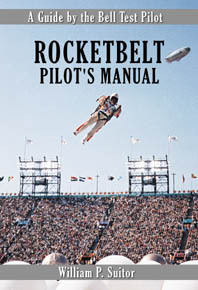 It covers everything from servicing, to fueling, to the actual learning step-by-step of how to fly a Rocketbelt. BUT IT IS NOT INTENDED TO ENCOURAGE ANYONE TO TRY TO BUILD ONE !!!! The book covers the science of the Rocketbelt in simple and easy layman's terms, you do not need to be a "Rocket Scientist" to read, understand or, most of all, enjoy this book. It answers most of the frequently asked questions Bill Suitor has been asked in over 45 years' involvement in the project. The Rocketbelt Pilot's Manual offers photos of each and every component of the machine with explanations of their relation to one and other. It is the first and only autobiographical book about the most misunderstood, and aspired-to, means of flight, the rocket backpack. Bill Suitor is the one telling the story. He is the man who has lived the dream....and survived all these years after over a thousand flights. There have been hundreds of magazine and newspaper articles written about the rocketbelt, and how it began, but none tell the story through the eyes of the "man who wrote the book on Rocketbelt flight." Who can forget the words of James Bond (Sean Connery) in the movie "Thunderball" as he tossed his rocketbelt into the trunk of his Aston Martin..."No well-dressed man should be without one."